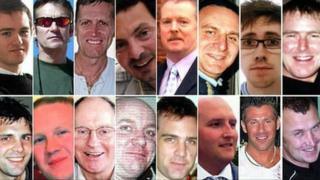 The 10th anniversary of a North Sea helicopter crash in which 16 men died has been marked by a service of remembrance. All 14 passengers and two crew lost their lives on 1 April 2009 when the Super Puma came down off Peterhead. A "catastrophic failure" of the main rotor gearbox as a result of a fatigue fracture was to blame. Relatives of those who lost their lives were at Johnston Gardens in Aberdeen on Monday afternoon. The lunchtime memorial service was being followed by the lighting of candles of remembrance at the oil industry chapel at St Nicholas Kirk. Twelve of the victims came from Scotland - eight from the north-east. Three of the victims lived in England and one was from Latvia. Deirdre Michie, chief executive of industry body Oil and Gas UK, said: "As we mark the 10th anniversary of the tragic Super Puma helicopter crash in the North Sea, our thoughts remain with the families, friends and colleagues who lost loved ones that day and we will never forget them. "This anniversary serves as a stark reminder that we can never be complacent about ensuring safe operations in our industry. "The safety of our people has to be at the heart of all that we do, day in and day out, 24/7, because we all need to be able to go home safely." The Super Puma helicopter, operated by Bond, crashed about 11 miles north east of Peterhead as it was returning to Aberdeen Airport from BP's Miller platform. The Air Accidents Investigation Branch (AAIB) pinpointed the failure of the gearbox in its examination of the crash. A later Fatal Accident Inquiry (FAI) concluded that the crash could have been prevented. On the anniversary, the RMT union repeated its call for a public inquiry into helicopter safety, which it described as the best way to restore workforce confidence. The two crew who died were Captain Paul Burnham, 31, of Methlick, Aberdeenshire, and co-pilot Richard Menzies, 24, of Droitwich Spa, who worked for Bond Offshore Helicopters. The KCA Deutag employees killed were Brian Barkley, 30, of Aberdeen; Vernon Elrick, 41, of Aberdeen; Leslie Taylor, 41, of Kintore, Aberdeenshire; Nairn Ferrier, 40, of Dundee; Gareth Hughes, 53, of Angus; David Rae, 63, of Dumfries; Raymond Doyle, 57, of Cumbernauld; James John Edwards, 33, of Liverpool; Nolan Goble, 34, of Norwich, and Mihails Zuravskis, 39, of Latvia. The other victims were James Costello, 24, of Aberdeen, who was contracted to Production Services Network (PSN); Alex Dallas, 62, of Aberdeen, who worked for Sparrows Offshore Services; Warren Mitchell, 38, of Oldmeldrum, Aberdeenshire, who worked for Weatherford UK; and Stuart Wood, 27, of Aberdeen, who worked for Expro North Sea Ltd.